A powerful Delta II rocket blasting into space on Aug. 4, 2007. For nearly 30 years, the Delta II rocket system was a reliable workhorse that launched numerous spacecraft away from Earth, with a success rate of 98.7 percent. The Delta family of rockets has a long history, with roots in the United States' earliest efforts to reach space. Born from the Thor intermediate-range ballistic missile, Delta rockets kept growing in power and capability. Today, the Delta rockets are built by United Launch Alliance (ULA), which formed as a joint venture between Lockheed Martin Space Systems and Boeing. The last launch of the Delta II carried NASA's ICESat-2 satellite into space on Sept. 15, 2018. The Delta IV rocket — an expendable launch vehicle designed by McDonnel-Douglas, which later became part of Boeing— began carrying the U.S. Air Force's largest and most important military satellites into space in 2002 and continues to do so today. "It's been a very, very prominent part of space history," said Scott Messer, program manager for NASA programs at ULA, told the press just prior to the final launch. McDonnell Douglas Corporation, an aerospace manufacturing company, designed and manufactured the Delta II rocket in the early 1980s, before United Launch Alliance took over production in 2006. The U.S. Air Force was the first to commission Delta II rockets, when, in January 1987, the branch awarded a contract to McDonnell Douglas for the construction of 18 Delta II rockets to launch the Navstar GPS satellites. The first of these launched on Feb. 14, 1989, from Cape Canaveral, Florida. For more than 20 years, Cape Canaveral was the primary launch site for the Delta II. The dual towers supporting Delta II launches were demolished in July 2018. Since then, Delta II flights have taken off from Space Launch Complex 2 in Vandenberg Air Force Base in California. Unlike the more modern, computerized methods used with other rockets, Delta II's launch sequence requires an operator to physically click a mouse button. When the launch system was designed, NASA preferred having a person in control rather than a completely computerized system, according to The Planetary Society. After the Delta II's initial launch, in 1989, the rocket continued carrying GPS satellites into space for the Air Force until 2008, when the contract expired. The rocket played a significant role in launching NASA missions. Between 1998 and 2010, the rocket delivered nearly 60 percent of the agency's scientific satellites into space. Several missions to Mars have launched thanks to the Delta II, including the Mars Pathfinder (in 1996), the Spirit and Opportunity rovers (in 2003), and the Phoenix Mars Lander (in 2007). 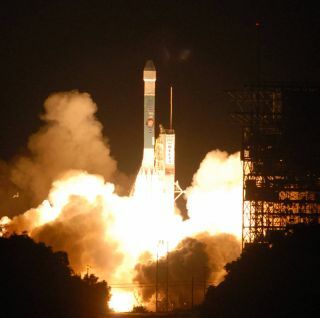 Delta II rockets also launched the Deep Space I mission (1998), the Stardust mission (in 1999, to return a sample from a comet), the Fermi Gamma-ray Space Telescope (a space observatory to study the high-energy wavelengths of the universe, in 2008), the Kepler planet-hunting space telescope (in 2009) and the twin GRAIL spacecraft to the moon (in 2011). "Both commercial and government markets recognize [that] the Delta II is a very reliable launch vehicle. But there are other competitors coming on the market," Hieu Lam, Boeing Launch Services' Delta commercial program manager, told Space.com in 2010. The rocket's final blastoff on Sept. 15, 2018, carried NASA's ICESat-2 spacecraft into orbit, where the satellite will use a laser altimeter to map Earth's ice sheets. That launch was the 155th flight of a Delta II rocket since the rocket's debut in 1989 and marked the 100th consecutively successful Delta II launch. "Being the last Delta II mission, ICESat-2 is extra special; the sense of pride in working on the last mission has permeated the whole team," Bill Cullen, director of launch operations for United Launch Alliance, told The Planetary Society. "While it is always a little sad to end an era, the team's learning, teamwork, processes and mission focus live on in the enterprise." The Delta II relies on the RS-27A as its main engine — a single-start, fixed-thrust liquid-bipropellant gas generator with two vernier rocket engines. The vernier engines help provide vehicle roll control during flight, and each contributes more than 1,000 lbs. of thrust (4.45 kilonewtons) to the main engine. The Orbital ATK Graphite Epoxy Motor (GEM), the standard solid rocket motor for the Delta II, comes in two options. For the 792X model, six of the 40-inch (100 cm) core diameter GEM-40 motors are ignited at liftoff, while three more are ignited in flight after the first six burn out. The 732X and 742X models include three or four GEMs respectively, all of which are ignited at liftoff. A heavier GEM-46 is made available for Delta II Heavy (a larger variant of the Delta II) liftoffs. GEM-46 has a 46-inch core diameter and burns 14 seconds longer than the standard GEM. The second stage is powered by an Aerojet AJ10-118K engine, a pressure-fed engine in which a separate gas supply pressurizes the propellant tanks to force fuel and oxidizer together into a combustion chamber. The AJ10-118K has played a role in rocket history for over half a century and can restart or affect the direction of flight. While in the air, the second-stage hydraulic system controls how the rocket rotates on its side-to-side and vertical axis (pitch and yaw). A redundant attitude control system (RACS) uses nitrogen gas to provide roll control, the rotation from front to back, as well as pitch, yaw and control during unpowered flight. Depending on the payload, the Delta II offers an optional third stage, but it can fly with only two stages. The additional spin-stabilized, third-stage motor, the Star 48B motor, is produced by Alliant Techsystems. The design incorporates high-energy propellant and a high-strength titanium case, and boasts multiple tabs for attaching external hardware.